This website contains material which is owned by Somothemes. This material includes, but is not limited to, the design, layout, appearance and graphics. Reproduction is prohibited other than in accordance with the copyright notice, which forms part of these terms and conditions. Unauthorized use of this website may give rise to a claim for damages and/or be a criminal offence. All submissions published on Somothemes.com can be copied, utilized and printed PROVIDED there is a reference made i.e. providing a link to the article and citing Somothemes.com as the source. From time to time this website may include links to other websites. These links are provided for your convenience. They do not indicate that we endorse the website(s). Somothemes has no liability for the content of the linked website(s). OneSomo subscriptions will be automatically renewed every month. This renewal date is based on the date you signed up, and is reflected in your statements accessible in your dashboard. By subscribing to OneSomo membership, you are agreeing to be bound by our monthly recurring payment until the date you cancelled your subscription. Theme update and supports is available for OneSomo members. 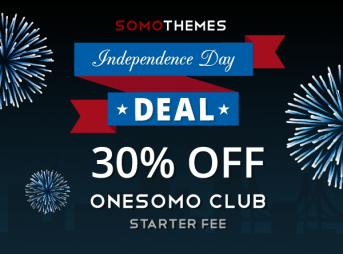 You are not eligible for any theme update or support if you are not a OneSomo member, or your OneSomo subscription has been cancelled. For A La Carte theme, you will be granted 1 year access to support and update of that specific theme. Somothemes.com shall not be responsible for and disclaims all liability for any loss, liability, damage (whether direct, indirect or consequential), or expense of any nature whatsoever which may be suffered by you or any third party (including your company), as a result of or which may be attributable, directly or indirectly, to your access and use of the website, any information contained on the website, your or your company’s personal information or material and information transmitted over our system.